Wooden cooking spoons are a kitchen essential, so be sure to choose the right one. My relationships with wooden spoons tend to be polyamorous. Being forced to pick a favorite would be a serious conundrum, akin to deciding between Rubber Soul and Revolver as my favorite Beatles album, or toasted marshmallow and buttered popcorn as my favorite Jelly Belly flavor. Over the years, I've collected dozens and dozens of wooden spoons, from the classic round-headed number I stole from my mom's drawer before heading off to college to the oversize, cricket-bat-shaped version I got when it was my job to stir and scrape 20 pounds' worth of ragù bolognese every morning at a restaurant I worked in. I've seen a full-grown line cook shed a tear when his favorite spoon of 15 years finally cracked in half while he was deglazing just a bit too aggressively. So, when somebody asks me which wooden spoon is best, I always give the same advice I give when recommending knives, wives, or magic wands: It's an inherently personal decision. If it feels right to you, if it sits comfortably in your hand, if you get a little spark of joy every time you reach for it, then you've found the right one. 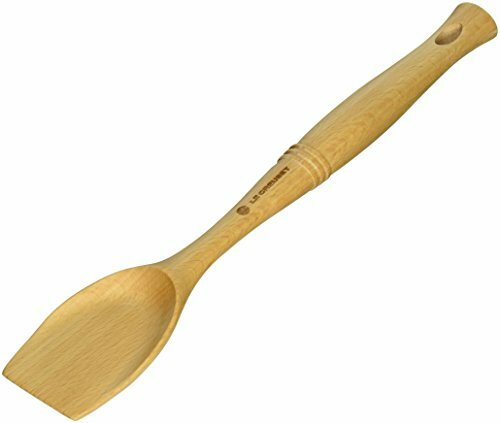 My personal winner is this Le Creuset wooden scraping spoon. Before I explain why, though, let's look at some basic criteria that went into my testing. Stirring is a spoon's primary task. It has to have a wide surface area so that you can move a significant amount of food around the pot with limited effort. It'd better also have a long, sturdy handle, with a shape that sits comfortably in your hand. Scraping is necessary to get cooking food off the bottom of the pot, and for deglazing the browned bits off the bottom of the pan when making a pan sauce or braise. Tasting as you go is a necessity. A good spoon will have a bowl large enough to lift up liquids or small pieces of solids, but not so large that you can't fit the end in your mouth. The main factors that affect these functions are material and shape. Because wood is soft and deforms relatively easily compared to, say, metal, it's great at following the contour of the bottom of a pan, even when there are micro-aberrations in the surface. Wood is also much firmer than silicone or rubber, which means you don't miss out on scraping up even stubborn spots of browned meats or vegetables. Your stews and soups will be tastier for having been scraped and stirred with a wooden spoon. Meanwhile, heat-resistant nylon spoons are enjoying a brief moment in the sun, but I can't understand why. They're simply too hard to work properly. Sure, maybe they won't break after 15 years, but they won't give slightly the way a wooden spoon does—you may as well be using metal. They do exactly what a wooden spoon does, only worse, and for more money. Ludicrous. Apart from these bi-material spoons from Le Creuset, which come with pros and cons of their own (though mostly pros), I firmly believe that only wood will do. The best are hard, lightweight, durable woods, like beech, maple, or (the new eco-friendly favorite of many manufacturers) bamboo. Wood isn't only naturally a little giving, but also softer on the hands, and, with time, it will slowly conform to the shape of your hand and pot. But just because you're picking up the right kind of wood doesn't mean you've landed the ideal spoon. Shape is absolutely critical. Round-headed spoons, like these cheap, functional models, are the classic, consisting of a circular or oval-shaped bowl at the end of the handle. They're good for stirring and for lifting soups and sauces for tasting. They do, however, have two major drawbacks. First off, because of their completely round shape, it's very difficult to make full contact with a large portion of the pan bottom, making it a pain to scrape up browned bits when deglazing a stew or making a pan sauce. The second issue is that they simply don't fit into the corners of a straight-walled sauté pan or Dutch oven. That can get seriously frustrating when you're stirring a full pot of creamy risotto and the bits of shallot or rice constantly get stuck into the corners of the pan and burnt. It's the cooking equivalent of trying to read a book outdoors on a windy day—painfully annoying. A couple of clever manufacturers have come up with solutions to both of these problems by flattening out the heads of their spoons. 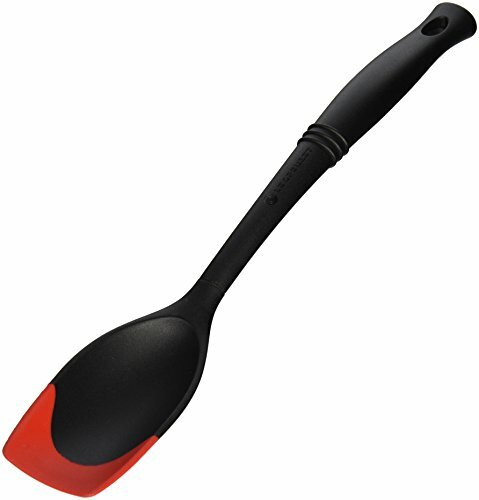 The Le Creuset wooden scraping spoon,* with its wide head, flat scraping edge, thick and sturdy construction, and wonderfully ergonomic handle, is perfectly designed, top to bottom. You really couldn't ask for more. My favorite feature is the sharp angle between the flat leading edge and the sides of the spoon. It's almost—but not quite—90 degrees, making it really easy to get into the corners of your Dutch oven or saucepan, where a lot of tasty browned bits tend to find cover from a standard wooden spoon. I can't say that this will become the only wooden spoon in my life—I just can't be tied down that way—but you can bet it's gonna get some pretty heavy use as I simmer, braise, and stew my way through the winter. * Between this post and my previous post about Le Creuset's bi-material spoon, even I might start thinking that I'm some kind of shill for the company. I assure you I'm not. The company just happens to make some darn good spoons, is all.